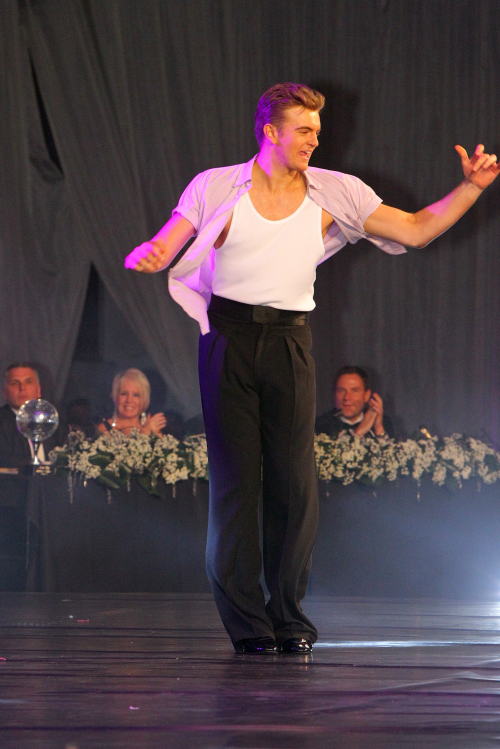 Jonno Davies was a contestant in Strictly MK, a charity fund raising competition on behalf of Willen Hospice and MacMillan Cancer Support, last weekend. Based on the same format as Strictly Come Dancing, Jonno partnered professional dancer Leah Rolfe. The couple performed two dances in the heats before performing their Michael Jackson-inspired showdance to “The Way You Make Me Feel”. Jonno and Leah finished second in the competition overall. This lavish regional event was held at the Bury Farm Equestrian Centre in front of an audience of over 1,400. Judges included former Strictly Come Dancing contestants Matt Baker and Richard Arnold. Another former Strictly contestant, TV presenter Andrew Castle was compere for the evening. The couple scored a maximum four tens for their showdance, which prompted Andrew Castle to predict that Jonno would take part in Strictly Come Dancing at some point in the future. Other contestants included Gail Emms (Olympic badminton silver medallist), Anne-Marie Davies (former Brookside actress) and Brian White (former MP and the current Mayor of Milton Keynes).